Oh my! I see now, hoomin. It's much, much worse than I thought. I think it's rather hopeless. ... sorry, hoomin, it's not me, it's you. And who, disguised as Mickey Kent, mild-mannered reporter for a great Metropolitan Bunspaper, fights a never ending battle for Truth, Justice, and an abundance of Carrotinis. Look, up in the sky! It's a bird! It's a plane! It's ...THUMP! Stop looking up, hooman, and get back to those bun chores! Oh my. When Bunns fly. 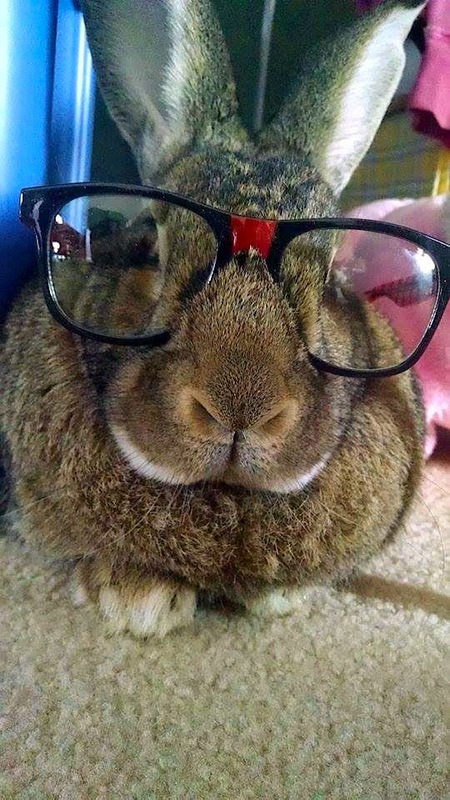 20/20 disapproval inspires more efficient delivery of carrotinis. I really disapprove of the glasses. What an adorable big bun face! Must ... Resist ... Urge ... To ... Kiss ... Bunneh nose!!!! Actually... No! Why should I resist? I can take a bit of bunneh Disapproval! What a handsome bunneh you are, Mikey! The better to disapprove of you with?